Barcelona and Real Madrid's top players could move to England after the Premier League's new television rights deal, says La Liga president Javier Tebas. Sky and BT Sport have paid a record £5.136bn for live Premier League TV rights for three seasons from 2016-17. "We have a serious problem. We won't be the best league in a year," Tebas said. "We're going to lose a lot of value in the market because the Premier League is going to snap up all of the global TV competition and contracts." The Premier League's new deal represents a 70% increase on Sky and BT's current £3bn deal. The Spanish system of each club being allowed to negotiate their own TV deals does weight the competition in favour of the heavyweights. 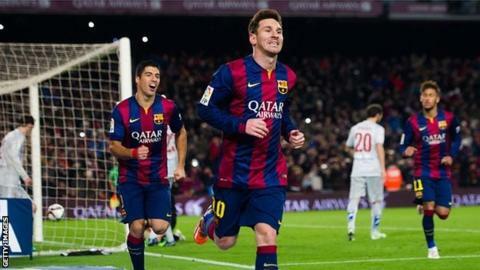 In 2012-13, Real Madrid and Barcelona each received over £110m in TV income. Atletico Madrid and Valencia were the next highest, at £33m. But Real Betis were one of six clubs who only received £9.5m. Arsenal manager Arsene Wenger said the "impressive" value of the new contract "will contribute to get the best players all over the world to come to England". He added: "The movement of the players is always linked with the economical and financial power in the countries. "When I was a coach in Monaco we bought the English players because we were the first to have the television money. Today, the biggest financial power is in England and the best players come to England." Tebas claims Spanish football must seek to redress the balance with a switch to collective bargaining for television deals. La Liga, where the broadcast rights are held by Barcelona-based Mediapro, is the only top European league in which clubs negotiate their own TV contracts. "Unless we urgently move towards centralised TV rights sales, Spanish football is going to have a very serious problem," Tebas added. "Economically we'll end up with a fifth-level competition." Espanyol president Joan Collet claimed this week that some top-flight clubs are ready to strike if the government does not pass a law mandating collective bargaining in La Liga.